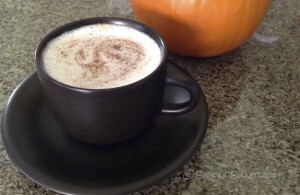 This is an extremely simple and healthy alternative to the popular but expensive coffee shop pumpkin latte . The coffee shop latte is pricey for sure, but it also is generally full of artificial and unhealthy ingredients. Ok so here’s another big difference, this is made with tea and not espresso or coffee. For many years I drank coffee – and I still would – if I hadn’t found out that caffeine can have some pretty bad effects on your body. I have to stay away from it. Many teas also contain caffeine so I was really happy to find rooibos, it tastes good and it’s incredibly good for you, even kids. This version of the popular fall drink is about 19 calories using raw cow milk (Only 4 if you use almond milk) as opposed to 380 calories from lord knows what in the mix they use! I know it contains some sort of dried milk and whopping 49 grams of sugar but I’m not sure what else. Also this version here has only 1.5 grams of sugar. Here’s a great post on why you should stop eating and drinking sugar. I don’t feel there are any man-made substitutes out there worth using on a regular basis so when I do add a sweetener to my cooking I use raw honey, maple syrup and rapadura sugar. If you have to have it sweeter try just a touch of one of these. Since this healthy beverage is made with rooibos tea it is caffeine free and is naturally sweet so IMO this requires no added sugar. As I mentioned above I try to limit sugar as it really is the root of much evil in your body. If you do add sweetener to this remember it will also contribute to the overall calories. 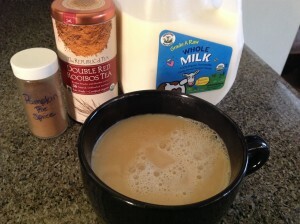 Then of course there are the health benefits of rooibos tea…. Fresh organic or at least quality spices are key here for flavor, I make my own pumpkin spice mix but you can buy it pre mixed all over, especially this time of year. Spices are incredibly good for you. Cinnamon can help lower blood sugar, arthritis pain and a slew of other things. Add a bit extra of this to the mix if you like!! You could cheat here and just buy a pumpkin spice rooibos tea if you like, but I think they fresh spices are better for you and taste better too! 1/8 of a cup fresh raw milk or homemade almond milk …this can be steamed if you wish, I like mine as is. Add spice to tea when it’s nice and hot and mix, add milk and serve. A sprinkle of spice on top adds a nice touch.